Friday, September 8th - Scholastic Book Orders Due, click here to order online (class code M97HD). Thursday, September 14th - JA in a Day, this is an in-school experience for 4th grade. If you weren't able to make it to Curriculum Night, or you just need another look, below is the presentation that the 4th grade teachers shared. Please let me know if you have any questions about the information shared here. This week we continued our study of place value in Topic 1. Students learned how to round numbers and create mathematical arguments using their own thinking and evidence. On Wednesday the Woodpeckers completed the Topic 1 Online Assessment. This short 10 question assessment will help students with their online test taking skills, as well as provide me with valuable data for designing Math Workshop in Topic 2. We finished up the week with our start of Topic 2, Adding & Subtracting. Students learned how mental math can be beneficial when adding or subtracting and also how to use estimation to find approximate answers when doing addition and subtraction. If you're looking for extra math practice for your student, there are some options you can access at home. Xtra Math is a great tool for practicing basic math facts. Students brought home a handout with login information. It's important that they set up their home account with these directions so that their progress at home will be applied towards their class progress. Pearson Practice Buddies make for a great review of each day's learning. Follow the step-by-step guide to accessing this resource. Begin by clicking on the link to Clever. Students should "Log in with Google" using their Parkway Google Login (the one we use in class). Click the "Pearson Resources" icon. Click on the "Realize" icon. Click on the "Classes" icon to view any open assignments. On the class Blog there are specific learning tutorials and games based on the learning target we are working on. Students can access these resources by clicking the "Math" page on the blog. Our Science time was still spent working on establishing classroom procedures and routines. Students also spent this time working on their "What Makes a Leader" project. Next week students will begin their first science unit. This year each 4th grade teacher will teach one unit and the students will rotate throughout the year. Our class will begin the year with Structures of Life which will be taught by Mrs. Waters. This week in writing students continued their work on their narrative stories. We are still in the developing phase. Students began the week by looking back at their Narrative Cold Write. A Cold Write is a story the students create before any teaching has been done, sort of a pre-test. Students used a writing progression rubric to self-assess and set goals. Students shared personal writing goals and displayed them on the class goal board. Next students dove into developing the characters for their stories. Students spent time thinking of character struggles and motivations in order to give the story drama. Using that information students planned a rough outline of the story. We moved closer to drafting later in the week when they began writing scenes for their stories. Students organized these scenes into order and continued to build up their outline. We are not yet drafting, but continuing to build towards the draft. We will begin drafting in writing next week. 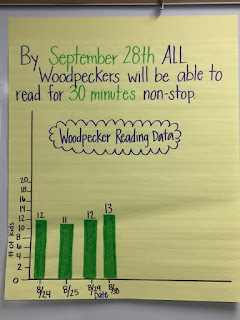 One of our big goals right now in reading is to make sure ALL students can read for 30 minutes non-stop each day. Students' stamina should be increasing as the year progresses. 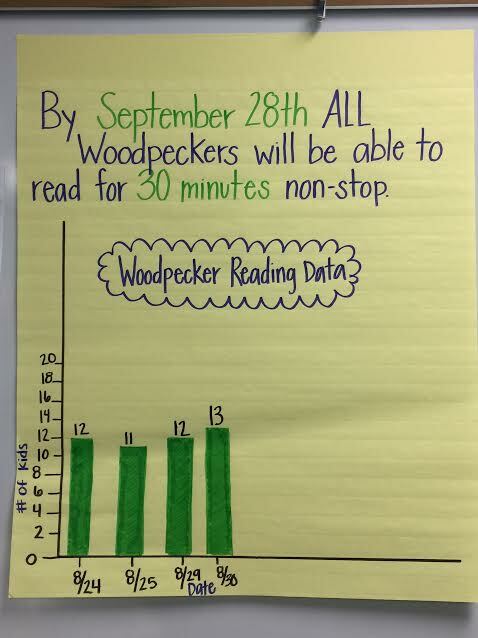 Remember, students should be reading for 30 minutes each night as part of their 4th grade homework. This will also help to build stamina. This week in reading students completed the SRI reading assessment. This is an early screening tool we use to determine "at-risk" students in reading. We will begin additional testing next week. Students learned the importance of envisioning while reading and how to make movies in their minds. We also discussed character traits and practiced finding evidence from the text to support those traits.